Love the mystery concept idea about the story but the direction is dull, script is flat with characters, and it is forgettable. 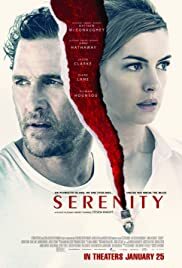 Serenity (2.5 out of 5 stars). Serenity sure is something for a neo-noir thriller film that does mislead you on what the actual plot is about. Matthew McConaughey delivered a good performance. Sadly, the film falls flat as a mystery thriller that tries play smart but gives you an empty satisfying result. Kind of reminded me how the sci-fi thriller Transcendence film with Johnny Depp was. Delivered an interesting mind bending concept but an empty satisfaction of the results. The plot follows Baker (Matthew McConaughey) who lives in a small town on an island. He is obsessed on trying to catch a large tuna fish known as "Justice." So obsessed, he pushes aside his own visitors that pay him to take them out to sea. When his ex wife Karen (Anne Hathaway) shows up on the island. She asks for his help to take her husband Frank (Jason Clarke) out to sea and kill him. Cause he has been abusing her and her son. That is enough what I can say about the plot without giving away details or spoilers. Besides, it is one of those movies were the plot changes gears in the middle of the second act. With a lot of people on the island being suspicious and not knowing a clue about anything. Or a stranger Reid (Jeremy Strong) that shows up in a suit and is creepily staring at Matthew McConaughey throughout. Or walking through the ocean in a suit. The film does have a great amount of mystery ideas. With Baker being obsessed with this tuna fish. Figuring out everyone's motive on the island. The twist is a game changer that turns the film into a different direction. It is not as surprising or shocking when it is revealed. Matthew McConaughey delivered a good performance as Baker. Along with Anne Hathaway. 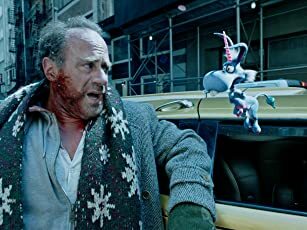 Jason Clarke was okay playing an abusive character. The direction is kind of dull. It tries to build some suspense and mystery. Instead, it is a tedious thriller that is forgettable. Overall, Serenity is a bad film. It started out great. It has an interesting concept of ideas with this mystery building of people being weird on an island. After the twist is revealed, it did not leave a satisfying shock factor besides it probably will be forgettable once the credits begin.